Ask not what you can do for Amarok. Ask what Amarok can do for you! Many years ago, just the mention of this music player would invoke shivers down my spine. It was stylish, exotic, modern, elegant, powerful. It did everything superbly, and there was always a hidden Joker up its sleeve. The plethora of options and possibilities and feature was endless. And then it all changed. 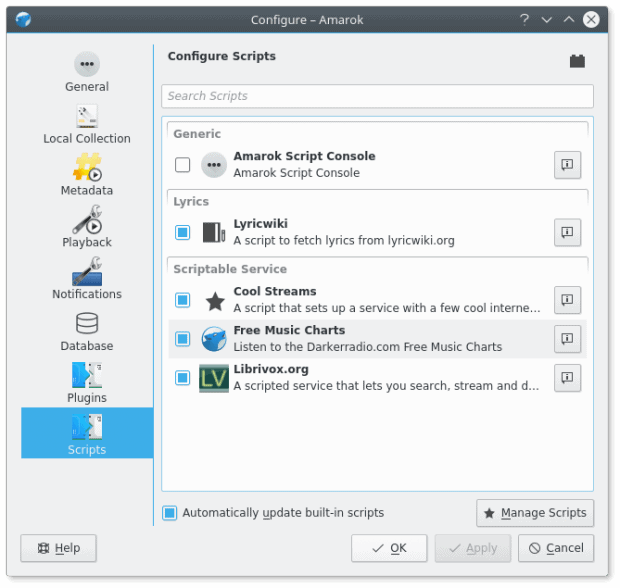 Amarok slid out of the spotlight and became just another program to play your music collection. Recently, fueled by nostalgia and perhaps vain hope, I’ve invested fresh new energy and time working with it, taming it, fighting it, loving it, hating it, trying to figure out how relevant, sleek and accessibility this player still is. My curiosity peaked with the extensive Plasma testing I did last month in my somewhat ultra-long article The State of Plasma. So I fired KDE neon once again, a brand new image, and started fiddling. Here’s the Spaghetti Western of what to expect. With a big disclaimer. Read on. Your first experience with Amarok will probably be your local collection of songs. 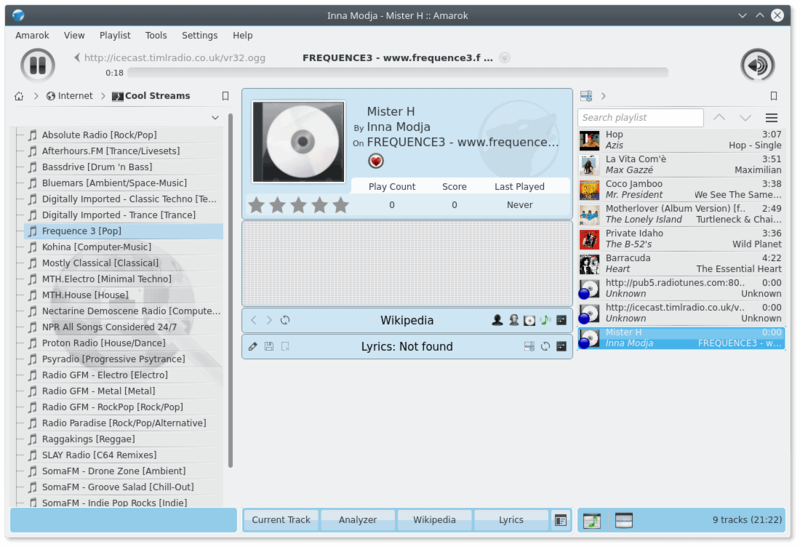 When the player launches, it will try to initialize all sorts of Internet services as well as scan your local directories for songs. Some of these may time out or take a long time, but this is something we will discuss later. Your local content should pose no challenges. Playing MP3 songs is quite delightful. The tracks are sorted in a nice, elegant way in the side pane, and you can also re-arrange and re-order them as you see fit. Once you start playing songs, they will also show up in the Playlist pane on the far right. In the middle, you will have the current track playback and options, as well as additional views live-scrolling like lyrics, Wikipedia information and some funky visualization. Amarok will help you sing badly while you listen to your music. Lyrics, inside your music player, and they will scroll with the song, so there’s no confusion what line you should sing next. This is a basic thing, but it works fairly well. And of course, you can edit the lyrics if you feel they are wrong. Amarok will even display lyrics for online radio streaming, provided it can identify the song and retrieve the lyrics. However, it may not always find lyrics, especially for non-English songs. In my brief test, Bulgarian and Italian texts were left out. That’s not a biggie, but then, what if I do want to be a special snowflake and sing in all manner of languages? I was really looking forward to improving my Foreignian. 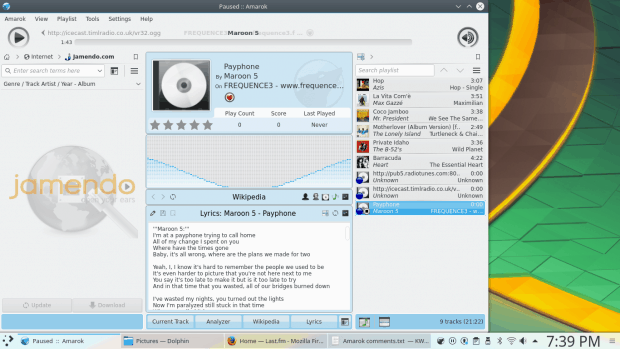 Amarok is not just a music player. It’s also a music browser. 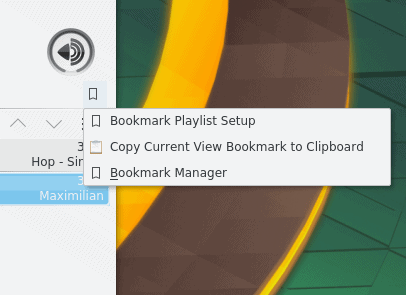 You can add bookmarks to your tracks. Technically, you will be marking positions inside tracks, and then you can view them through the Bookmark Manager. This can be convenient if you wish to splice music or perhaps combine songs, or just something you find useful. Either way, it’s a nice thing. Moreover, you can also bookmark your playlists, which again can help sort out the clutter, especially if you have thousands of songs. Useful, especially if like specific segments or lyrics or something. 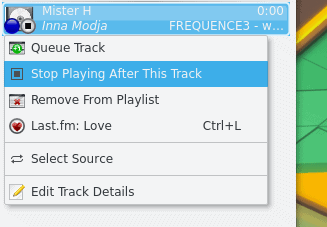 The music players has a fairly powerful track editing functionality. It’s not just metadata, labels and tags. You can also embed media art, which I don’t recall seeing in many other programs. This last piece is available through the main menu > Configure Amarok. 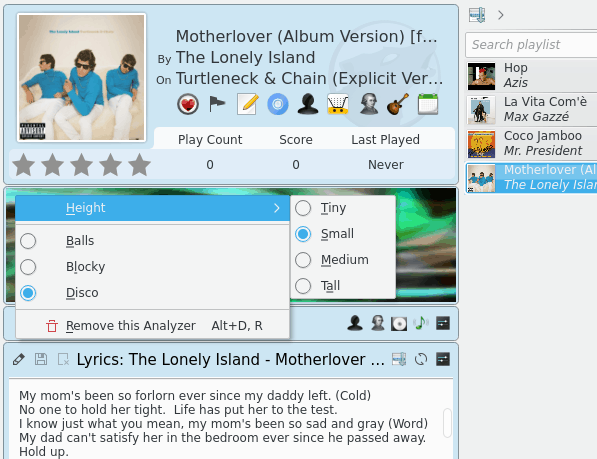 And of course, lyrics, which also feature in the main view and scroll while songs are actively playing. 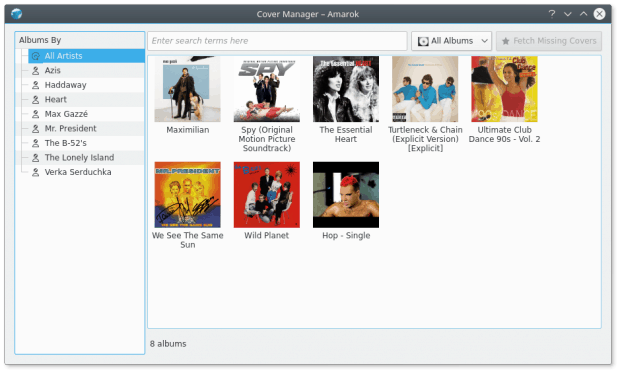 Amarok comes with a rich, visually pleasing cover manager. It lets you sort out your art work, as well as fetch missing covers, but this requires the right kind of metadata to be present in your tracks. However, you can always manually add images. Stylish and inviting, as it should be. 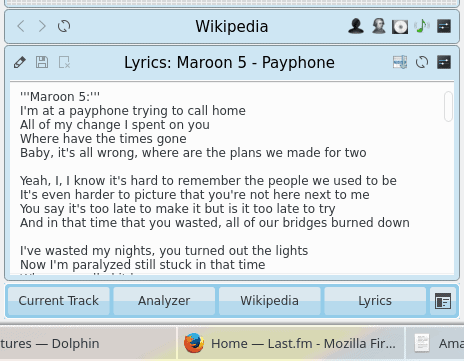 Amarok has a built-in MP3 music store functionality. While playing any which track, you can click the store icon, and this will open a search box + shopping cart view in the left side pane. 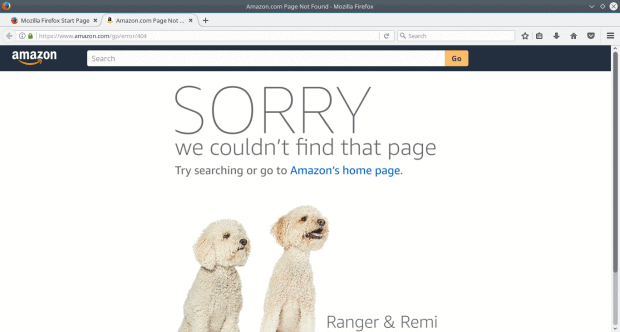 This is an embedded Amazon service, with all the available digital content Amazon has to offer. 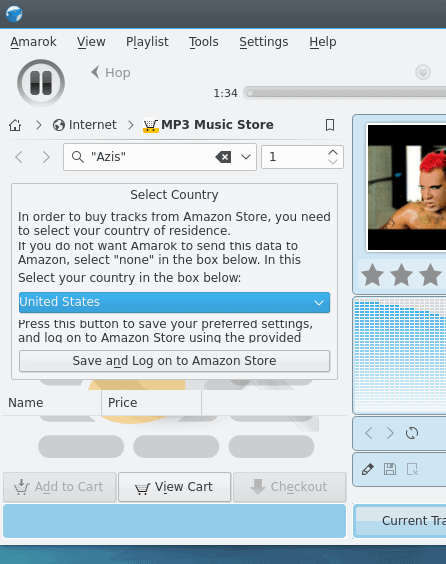 Here, you should be able to search for songs, add them to your cart, and then proceed to checkout. You are asked to choose the region, which makes sense, because different songs and prices are offered in different regions. Unfortunately, this is as far as you will get with this functionality. This plugin just does not work, complaining about a malformed entry. Nor does the page explaining the service in more detail exist on Amazon. 404. 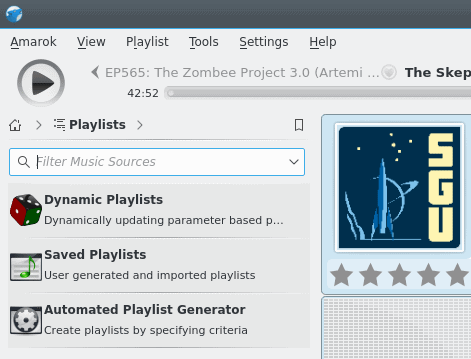 It would seem that whatever functionality was added into Amarok once upon a time (in the West, you must love my cliche references), it has quickly become outdated, and the music player no longer has the most up-to-date details to serve the users. Shame, because this could really be a blast, and this is something I’ve mentioned as one of the precursors for a truly professional Linux desktop. Ubuntu has suffered a similar regression across the board, especially with the removal of the Ubuntu One sign-on from the Software Center, but its Amazon app still works. The fix ought to be trivial, and it should not take much to revive Amarok and make it a relevant music-purchase tool. This is another broken service, it seems. If you’ve followed my Linux reviews, you know how often I’d screenshot Amarok, showing this or that artist’s bio on Wikipedia, usually Peter Gabriel, to be frank. For some reason, in this particular build, the search did not work. It might be a one-time glitch, but it’s a nice little extra, and you do feel its loss. Amarok calls these Cool Streams, and there’s a whole lot of them. Take your pick. Now, some of the stations will not play, while others will merrily chirp. In some cases, Amarok will even display lyrics for current songs, which is a nice added bonus. While finding the right stations can be a game of hit and miss, you should not find the functionality wanting. I have used Last.fm in the past, and normally I had no problems enjoying the steams. However, this is no longer true, since Last.fm removed its online streaming service in 2014. This makes for a rather dubious choice to have it as a valid entry in the list of online sources, almost three years later. If anything, it puts Amarok in a rather awkward situation. First of all, a broken service is never a good thing. 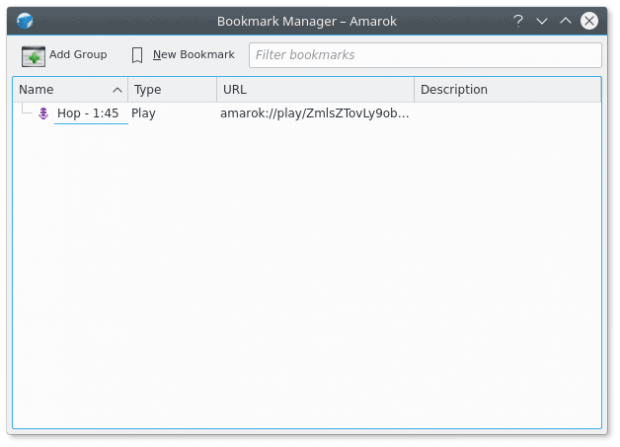 Second, people may assume that Amarok is a discontinued piece of software, which may not have received any updates in three years. That alone can deter users from running and enjoying the program. Now, technically, the last stable Amarok release does align with the dates above, but version 2.9 beta has been available since mid-late 2015, forever teasing, a ray of hope in a dark forest, now you see me, now you don’t. At the very least, the list of services and plugins should be loaded dynamically on startup, so that invalid or broken entries are disabled or removed, to minimize impact on the user. This is one of the featured online sources of music. For some reason, the service is also broken. This means you will not be able to test this service and see what it offers. This may change in other Amarok builds, but for now, it remains outside your reach. This is another disappointment, and like the rest, it reeks of several good years of neglect, broken dreams, and other miscellaneous problems. You have the option to subscribe to a music streaming service, but this comes with a hefty USD299 price tag, which is quite steep given you get no intro or free trail, and even more so if you compare to rival monthly-subscription services. Yes, we could argue the cost benefit per track, but that’s not how you lure in new users. I was also hesitant paying, without really knowing the whole process works as it should. The one Internet source that does work reliably: podcasts. The list is long and more colorful than the Hydrogen atom emissions, with a strong focus on geeky and nerdy stuff. Not that anything prevents you from adding your own podcasts. But I did come across several interesting sources, and even spent some time listening. This worked well overall, but there’s the initial confusion, as you need to decide how to navigate the list. Everything else Internet-wise was not working, to be frank. Either broken, or spinning endlessly, but sure there wasn’t any fun at the end of the tunnel. I believe this is a direct result of the distinct lack of recent development in Amarok. Then again, I do expect a very high level of flexibility, so that programs can maintain healthy and relevant behavior at all times. Self-checks, plugins, that kind of thing. As an example, Firefox disabled outdated or vulnerable extensions. Amarok should do the same. This is a purely cosmetic thing. But it does add a little bit extra flair to Amarok. I do like the fact you can transform the UI, but then, some other players really go wild with skins and looks, and they let you emulate all sorts of other players. However, Amarok does a simple, respectable job here. One of the removable insets is the Analyzer, which ought to come alive with different music-rthythm-synced visualization, like bars, balls, disco, and such. This is a purely cosmetic feature, and therein lies the problem. It has not been realized bug-free. My testing from the live edition of KDE neon (March 16 build) offered no animation whatsoever in the Analyzer view. Alas, this was meant to get me pumped, but it got me deflated. You can tweak the size and type of visualization, but for me, it was just static images. This is a nice one. It is all too easy to multi-click your tracks. Each time you do that, there’ll be another entry in your playlist pane on the right side. Personally, I’m not fond of playlists at all, but if you do like them, manually removing entries can be quite tedious. Amarok can cleanup the duplicates for you. There’s more, of course. 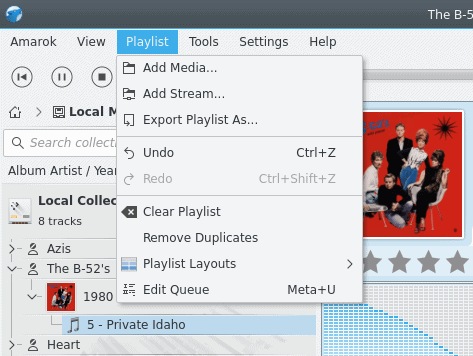 Export, import, queue options, dynamic updates, and auto-generation of playlists based on your criteria. Quite useful overall, especially for those with large, complex collections of songs. You begin to appreciate the functionality the more you use the program. Large music collections can be challenging to manage and catalog. Amarok has a very decent, very smart sort functionality, allowing you to go several levels deep and arrange your tracks so the OCD levels of stress are kept to a minimum. Three levels in total, all sorts of permutations. Quite nice. Amarok lets you stop playback after a certain song has played. 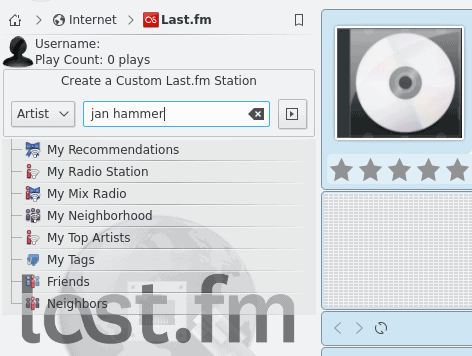 This right-click function can be activated on any listed entry in the playlist, including radio streaming, except it does nothing for online sources. In a way, this is a small, cosmetic fail, but the Devil is in the details. This isn’t Amarok on its own, this is Plasma as a whole. The system area integration piece is quite all right. You do have Amarok, with its own context menu, and then the volume button will become a media widget with controls and nice cover art. Enhances the flavor of the music experience, for sure. Coincidentally, the Play button visual bug, which I’ve highlighted in The State of Plasma article, has been fixed. Well, supposedly, you can change the moodbar style and colors. However, my first question would be, what is this moodbar thing? Secondly, generating mood files manually, that does not sound like a lot of funny. Predictably, as you can imagine, nothing really happened, no what which way I clicked. This looks an interesting UI customization option gone completely obscure. Amarok features a powerful, extensible system of plugins, which form the backend of the additional services, like most of the online channels. This is good, because you can enhance the basic functionality without radically changing the software. But then, plugins require continuous development to remain relevant. In a way, the level of neglect and chaos is similar to the themes, icons & decorations system in Plasma, with most of the stuff arranged in haphazard fashion, without a common, strictly enforced mechanism. The plugins work, and they are quite neat. Some are outdated. Overall, I’m pleased. On the other hand, scripts are there to perform all sorts of background tasks and enhance the overall experience for the user. However, I’m not sure how they differ from plugins. Also, some of these services were not working as well as they should. Perhaps I’m missing a bigger picture, but the fact both Plugins and Scripts use the same icon tells me that the separation is more arbitrary than functional. Remarkably, Amarok is a decent one. If you ignore some of the broken stuff, it delivers a compelling, stylish experience. Then again, if you cannot put aside the flaws and the scars, you will probably not agree with my assessment. The Internet side of things is wonky, the Wikipedia and the Analyzer are beginning to come undone (that’s an awesome song reference, you must admit), but then, like a sturdy Lada Niva jeep, it just plows on relentlessly through the snow. Befitting a music player with such a dope logo. Busy, colorful. I was having fun, but then a smiling face oft hides the scars within. Amarok is a playable [sic] thing, but there’s a lot of broken stuff that should be fixed, or taken out forever. Even almost three years without any active love, Amarok still has more good (11) than bad (6) or ugly (4) points. I think the local playback and lyrics are the strongest feature; online streaming and visualization the worst. Only the age is starting to show. Amarok does not handle the ever-mutating Internet landscape well, with links and services becoming outdated faster than a Milli Vanilli haircut. Can Amarok rise mighty again? Unlikely. It wouldn’t take much – to begin with, online support and smartphone support would totally revitalize it. But then, the old-new beta release has been out there for a long time, and the hope is dimming. Shame, because there’s a lot of essential goodness in Amarok. The reason why I once felt so passionately about Amarok. The music player that I used to know. Take care. 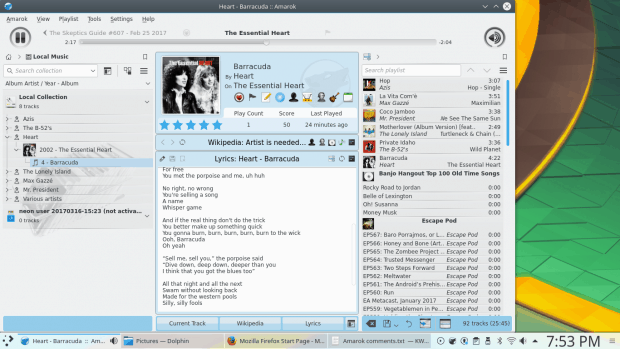 Three years without any love and yet we have probably had 50 new music players for Linux in that time. The conclusion is obvious. Well, 50 players or 100 players means nothing unless they do the job. 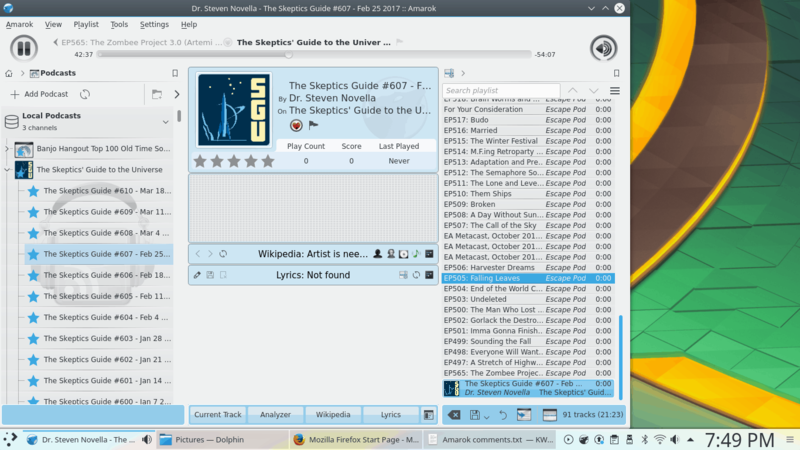 Is there ONE music player for Linux that truly does it all and in the darkness binds them? And there lies the fundamental problem. clementine has already overtaken amarok.. Also clementine virtually get default choice for all purpose music management system. I tried Amarok years ago, and found two things that disqualified it (for me). 2.) I could not find *any* way to get the player to play in “Album Shuffle” mode. My local music largely consists of “classical” and jazz albums, most of which need to be played album by album – I need the “Album Shuffle” function so that the albums do not play in a predictable order. 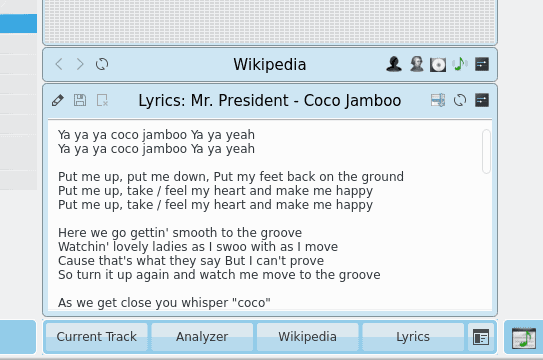 I have not found any way to create a playlist in Amarok (nor in Rhythmbox) that will fulfill this desire. For the KDE environment, Clementine fills this requirement nicely, as well as being more lightweight, and offering most, if not all, of the “good” points enumerated above. I *used* to like Banshee for GNOME-like environments, but many distros have deprecated it. Still, it did everything *I* required of it. It’s work very well on Clementine. I use Amarok to handle my podcasts it does that really well it checks for them in the background and can easily place it in the right folder. I hope it keeps finding an audience yes it has many issues and there might be better programs but it does what I need it to very well. Best of luck Amarok. When I migrated to KDE I decided to give a chance to every single component it offers, including Amarok as a music player. It was a fast journey from excitement to delusion, and I quickly shifted to alternatives, like Clementine or Tomahawk. Cantata is now emerging as a robust solution. Why not … WHAT’S THE MAGIC WORD? Well I’m not gonna say the magic word out of self respect 😉 document viewing is fundamental to everyone who uses a computer or mobile, equal to Internet browser and email and office etc, the quality choices are lacking in Linux, and the best, okular, is under threat of being neglected due to small numbers and little time, the poppler pdf based viewer is good but has ground to cover the epub is less than adequate, (couldn’t they use code from calibre, qt based app) and the rest, I think your critical eye and the importance of this application, you should do it to maybe spark something hopefully, maybe in the kde community it’s something that will have to go mobile for their mobile OS to be a successfully as well as the desktop,,, please do a review for these reasons, it’s a very important pillar of the desktop! For those looking for easy ways to contribute to open source, many of the “bad” here point to an obvious lack of automated testing (particularly integration testing). Such tests won’t boost the project in it’s current state, but it would allow developers to respond more quickly when something breaks.